Things will play out quite differently for a supermassive star like Eta Carinae, which lies 7,500 light-years from Earth. Weighing at least a hundred times as much as our sun, it will go out more like an adolescent suicide bomber, blazing through its nuclear fuel in a mere couple of million years and exploding as a supernova, a blast so violent that its flash will briefly outshine the entire Milky Way. The corpse this kind of cosmic detonation leaves behind is a black hole. For Eta Carinae, that violent end might not be long in coming, according to a report in the latest Nature. "We know it's close to the end of its life," says astronomer Armin Rest of the Space Telescope Science Institute and the lead author of the paper. "It could explode in a thousand years, or it could happen tomorrow." In astronomical terms, a thousand years might as well be tomorrow; as for a supernova blowing up literally tomorrow, well, that's almost unheard of. In 1843 Eta Carinae gave a hint that the end might be near when the hitherto nondescript body flared up to become the second brightest star in the sky, after Sirius. It stayed that way for 20 years or so, then faded and left behind a majestic, billowing cloud of gas known as the Homunculus Nebula. 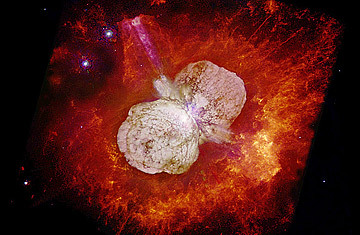 Eta Carinae lost some 10% of its substance in this event, which astronomers now call a "supernova impostor," after which it has returned to relative quiet  or what passes for quiet in such an unstable object. Astronomers back in the day did the best they could to observe the 20-year flare, but without modern instruments, they couldn't really learn much. That has frustrated investigators now just as it did then, since studying Eta Carinae in detail could tell them a lot about what caused the outburst and maybe even help them figure out when the inevitable supernova explosion is going to occur. But as the Nature report makes clear, that understanding may now be at hand. Using a fiendishly clever new observing technique, Rest and his colleagues have been able to take readings of the original blast in real time. "We can look directly at the eruption," says Princeton astrophysicist Jose Prieto, a co-author of the report, "as it's never been seen before." To understand how they did that, start with the basic fact that light from the outburst sped away from Eta Carinae in all directions. Some of it headed straight toward Earth to wow 19th century astronomers. But some of it took a detour, reflecting off dust clouds in interstellar space in what astronomers call a "light echo." At least a bit of that echo was redirected toward Earth. The dust clouds were so far from the star that the long-delayed light is only now reaching us, and unlike in 1843, we now have the instruments to study it. It gets even better. The 1843 flare-up played out over 20 years, which means the light-echo version will do the same. "We took observations nine months ago," says Rest, "and we were looking at 1843. Now we're looking at 1844. It's like a movie. It's really cool." (Of course, the images are from 7,500 years before 1843 and '44, since that's when the stellar event occurred; it just took 7½ millennia for the light to reach us.) Better still, astronomers can see light echoes from a variety of dust clouds, at varying distances from the star. That creates detours of varying lengths, so they can see different phases of the eruption all at once. "The big puzzle," says Prieto, "is what caused the outburst. This star has been studied to death with all sorts of telescopes, but no one theory has ever been able to tell us what happened." It might have been some sort of instability deep within the star itself, or the blast might have been triggered by matter dumped on Eta Carinae by a stellar companion. The good news is that the light-echo observations will give theorists a trove of information to work with  and in the next few years, says Rest, "we'll be getting more observations, and they'll keep getting better." If Eta Carinae is going to blow imminently, the obvious question is whether Earth is in mortal danger. Fortunately, the answer is no. At 7,500 light-years, the intense radiation from even a powerful supernova would lose its punch by the time it reaches us. All we'll experience is the most spectacular light show in many centuries. The last confirmed supernova explosion in the Milky Way happened in 1604, a teasingly close five years before Galileo pointed his first, primitive telescope skyward. It is, in short, about time for another big blast, and even though the theorists haven't weighed in, Rest has reason for hope. "There was one of these 'supernova imposters' in another galaxy," he says  something similar to Eta Carinae's 1843 outburst. "And then, a few years later ... kaboom!"